In a new study, researchers have discovered an ancient, four-legged whale along the coast of Peru. 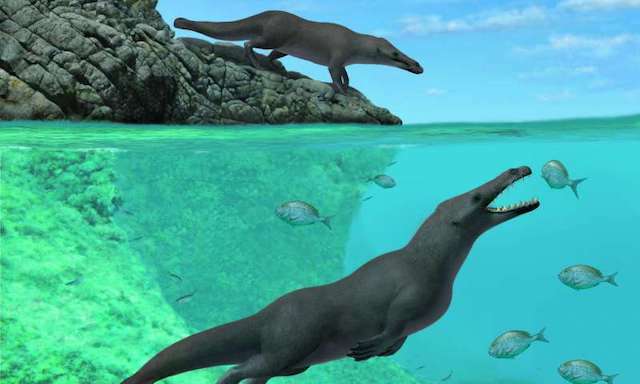 The ancient four-legged whale was found in 42.6-million-year-old marine sediments along the coast of Peru. The study provides the first record of a quadrupedal whale skeleton for the whole Pacific Ocean. It provides important information about whales’ evolution and their dispersal to other parts of the world. The research was conducted by an international team, including members from Peru, France, Italy, the Netherlands, and Belgium. Cetaceans are the group including whales and dolphins. They have originated in South Asia more than 50 million years ago from a small, four-legged, hoofed ancestor. Previous research has found a promising area for digging fossils in the coastal desert of southern Peru, named Playa Media Luna. In the current study, the team excavated the remains of an ancient whale they’ve since named Peregocetus pacificus. They found the presence of small hooves at the tip of the whale’s fingers and toes and its hip and limbs morphology. This suggests that this whale could walk on land. In addition, the whale had anatomical features of the tail and feet, including long, likely webbed appendages. These are similar to an otter, indicating that the animal could swim. The researchers precisely dated the skeleton to the middle Eocene, 42.6 million years ago. They also suggest that the animal could move its large body (up to 4 meters long, tail included), both on land and in the water. The findings suggest that early cetaceans reached the New World across the South Atlantic, from the western coast of Africa to South America. It is possible that the westward surface currents and shorter distance between the two continents helped this type of whale to travel. After they reached South America, the amphibious whales migrated northward and eventually reach North America. The team plans to study the remains of other whales and dolphins from Peru. The lead author of the study is Olivier Lambert from the Royal Belgian Institute of Natural Sciences.